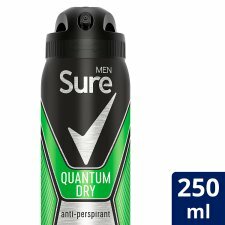 Sure Men Quantum Dry anti-perspirant deodorant aerosol 250ml is made to provide 48 hour protection against sweat and odour, so you can feel fresh, dry and protected all day long. This anti-perspirant deodorant has an invigorating and energizing scent with fresh citrus, spices and wood tones, giving you the confidence to keep moving all day long, whilst feeling fresh and dry. With MotionSense technology, this men’s anti-perspirant deodorant delivers freshness with every move. Microcapsules sit on the skin and break as you move, releasing a powerful burst of the clean, energizing fragrance and give you the confidence to take your day to the next level. Sure, It won't let you down. Each step, stride and sprint comes with an energizing boost. And with protection for up to 48 hours, sweat and odour won’t stand in your way. You can keep going to where you want to be, and that bit further. Feel fresh. Feel energized. Feel ready for anything. 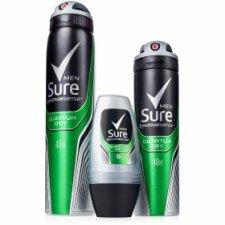 How to use: Firstly, shake the Sure Men Quantum Dry anti-perspirant deodorant can well. Then hold it 15 centimeters away from your underarm and spray evenly in a well ventilated area in short bursts. Avoid contact with eyes and broken skin.